With all the harsh weather the east has been getting lately, and the several flight issues I had last year around this time, I was a little apprehensive about traveling to the Pittsburgh show. But I was very pleasantly surprised to find out I didn't even need to bring my heavy coat. The weather in Pittsburgh was beautiful, as was the city itself with the three rivers and those hundreds of very cool bridges. The convention center was also one of the more open, well lit and architectually eye appealing convention centers I've been to. Overall, the show itself was on the soft side, with slow sales and a lower public attendance. That being said, I don' think I've been in a more friendlier town than Pittsburgh! I left OC on Tuesday morning and, as usual, we flew out over the ocean before turning around and heading east. I never get tired of seeing the gorgeous Newport Harbor and the Orange County coastline from the air! I had a connection in Denver, and must say that the view from the air of the snowy Colorado mountains was equally as amazing as the California coastline! Flying from coast to coast, especially with a connection, is an all-day ordeal and leaves me drained at the end of the day. I finally arrived in Pittsburgh late Tuesday night, checked into my room, and went straight to bed. Set up was Wednesday at 1pm, so I slept in before heading over to the convention center. As I mentioned, the weather was beautiful and not too cold. I took this picture of the city from the walkway between the hotel and the convention center. This is the pristine looking convention floor before all the kaos of dealer set up began. You can see how light the room is from the glass ceiling architecture. The convention center is right on the river with some beautiful views of the river, bridges and the city. The convention center was a bit of a maze, especially if you were coming from the hotel over the walkway, but at least the ANA had a lot of signage throughout the convention center so it was easy to find where the show was. There was a large crown of dealers gathered around outside the door waiting to be let in. After I set up my booth, I went over to the ANA museum area to see the amazing rarities on display. Just before I left for the show, I acquired a complete registry set of MS64/65/66 brown Indian cents from one of my customers (including several key varieties). But I still had some specific coins I was looking for so, before I headed back to my table, I walked around show to see what other Pretty Pennies I could find. Also, throughout the afternoon, several of my favorite vest pocket dealers also stopped by to show me their "wares." And being a one-woman show, I very much appreciate it when dealers stop by my table and let me look through their boxes. When things died down later in the afternoon, I opened a bottle of my very favorite wine that I had brought with me, Rombauer Zinfandel. After the show ended on Wednesday, the Pennsylvania Association of Numismatists was hosting a wonderful dinner event at the LeMont restaurant, which included being entertained by the Washington Jazz Orchestra. They had a bus take everyone to the restaurant which is located up the hill overlooking the three rivers. It was a really fun evening, with great food, a raffle and silent auction, and several guest speakers including U.S. Mint Director David Ryder. This is me taking a picture of ANA photographer Rob Kelley taking pictures of the orchestra Me and Abe Lincoln! The silent auction items I was bidding on the Caramel Crown Royal and Cuban cigars but when it got to $400, I had to bow out! Guests Speakers Dennis Boggs/Abe Lincoln who gave a great Lincoln-esque talk, and U.S. Mint Director David Ryder who gave a very informative talk and also announced that the Mint had no plans to stop minting the U.S. penny - yay! Tom Uram, PAN President/ANA Governor Towards the end of the evening, they announced winning raffle numbers, and I was lucky enough to win this little 1/10th ounce gold coin! It's the very first gold coin I've ever owned! Winning this coin was icing on the cake of an already wonderful evening! Thursday the show opened to the public at 9:30am. I was pleased to have several folks stop by looking for pennies right off the bat! Thursday morning was my best selling day of the show! Also, I truly enjoyed chatting with several forum members who stopped by to say hi, and a few allowed me to take their picture for my show report. Jim/Kranky Ray/Raybob15239 Jeff/StrikeoutXXX (he stopped by on Friday) By early afternoon, the public thinned out and the show slowed down quite a bit There were several very interesting and creative exhibits by collectors in the Exhibit area. My favorite was this one by my friend Rod Gillis on Money of Monopoly. It included original stock certificates from the same businesses that are featured in the Monopoly game. Another interesting exhibit was about the History of Nursing on pins and medals After the show on Thursday, we went over to the Church Brew Works for dinner and drinks. According to Wikipedia, "The brewpub is located at 3525 Liberty Avenue in the Lawrenceville neighborhood of Pittsburgh, Pennsylvania. The church building was originally built in 1902, and had been used as a church until 1993. Its doors opened as The Church Brew Works on August 1, 1996, after the building underwent extensive renovation, necessitated by years of lying dormant after being officially deconsecrated by the Diocese of Pittsburgh in 1993. In 2012, Pittsburgh Magazine named it one of the best breweries in Pittsburgh." In addition to the beautiful church architecture, the food and beer was delicious! Being half Polish, I grew up on perogies so I just had to try theirs and they were amazing! I also had a glass of their Quadroscope beer whih was slightly sweet and delicious! And we all split one of their signature raisen and apple bread puddings After we left the Church Brew Works, we headed over to the Rivers casino which was just across the river. We had a good time playing the Ultimate Texas Hold-Um game, and I was very happy that I ended up a few hundred dollars ahead by the end of the night! When I woke up on Friday, it was raining. This is the bourse floor before they let the dealers in The U.S. Mint was set up at the show - these were taken before the public was let in. They also set up a memorial library in honor of John Burns, a popular and beloved book dealer who passed away during a show a few years ago. Typically, the show was not as busy on Friday, with very moderate traffic. After the show on Friday, we headed over to Eddie V's for a steak/seafood dinner. Wow! What a wonderful dining experience we had there, with amazing food and a wonderful bottle of wine! The lobster bisque was so tasty, as was the seabass and the filet (covered with bernaise and crab). This very cool looking old building was right next to the restaurant. We also saw the peddle cars filled with folks peddling like crazy and having a blast cruising down the street! After dinner we headed over to the Ten Penny pub which we had heard about, so of course, we penny people had to check it out! Soon it was time to call it a night. On Saturday there were lots of families who came to the show, many of whom stopped by my table to ask about pennies they had found or inherited. Unfortunately, I had to advise most of them that the pennies they had wouldn't make them rich. However, a few people came by just to ask questions and learn about how to improve their collection. I gave them advice on learning to grade (I recommend "Making the Grade"), not cleaning their coins, don't buy damaged coins, etc. Several people asked me about some anomaly they found on one of their coins like a repunched mint mark, doubling, a die chip or crack, etc. For folks who like to do roll searching, I always recommnd the "Cherry Picker's Guide" to help them determine which types of varieties might be worth hunting for. One of the questions I get asked the most is what dates of coins should they be looking for that might be worth something. That's when I recommend they get "the Red Book" so they could determine which of their coins may be more valuable. Unfortunately (and unusually), there was no supply dealer at this show, so I advised these folks that they could find the books at Barnes & Noble or an online coin book website. Soon it was time to pack up and head to the airport and beging the long journey home. Bye bye Pittsburgh until August 2020 when we return for the ANA WFM! Hello my own sweet Pretty Penny! Next up: The Santa Clara Show next week, then Central States in Schaumberg the end of April! Charmy's March 2019 BALTIMORE SHOW REPORT w/lots of Pics! Star City Homer, it was very nice seeing you at the show. I've known Karl Stephens and his wife Joanne for many years. I was introduced to him by my mentor Alan Kreuzer when I very first started in the coin business, and since they live here in SoCal, we get together outside of coin shows when we can. We joined some of the same wineries in Temecula Valley and do wine tastings together as well. Karl finds me some of my Conder tokens too. Karl and Joanne are such great folks. USAuPz, Charlie explained about the letters and symbols but I found this information which explains it better than I can: In terms of markings, the Rooswijk bars are easy to decipher, but there is one mystery. At the top of the bar a large A announces the VOC Chamber (province) that issued the bar, in this case, Amsterdam. Immediately below the A we have the logo of the Dutch East Company, an interlocking set of three letters, VOC, standing for the Vereenigde OostIndische Compagnie. Next comes the unexplained item. In a small intaglio cartouche we see a rampant billygoat (geitebok) springing across a grassy plain. By Dutch law a silver ingot had to marked by the party responsible for refining it, so this must be the assayer's mark, although no Dutch assayer of the period owns up to the title of "Miijheer Willem Geitebok." Ongoing research by Dr. Arent Pol in the Netherlands may shortly disclose who "Mr Billy Goat" was. I was really concerned about making it to this show since I got stuck in Houston during last year's March show and had to turn around and go home. With all the recent harsh weather especially on the east coast, I began to think it was going to be de ja vu all over again. But I am thrilled to say that I had no travel or weather issues whatsoever, it was smooth sailing all the way there and home! I arrived at the John Wayne airport early Thursday - this is me very happy to be headed to Baltimore! So I decided to start my trip off right with a delicious Bloody Mary. Orange County had just been through a lot of heavy rain, but it was nice and sunny the morning I left I can't remember what part of the country we were over when I took this photo, but the white mountains were beautiful! I changed planes in Chicago where it was really, really cold just groing from the plane to the terminal! There was still snow out on the tarmac in Chicago. I finally arrived in Baltimore late Thursday night, went straight to my hotel and to bed because I had some early morning appointments, including to pick up a nice group of pennies in scarce old Doily holders that a dealer had called me about (I posted these in an earlier thread). The 1908 is especially nice, but I am very pleased to add these to my personal collection! I also had appointments with other dealers, including Laura's "super secret stealth seller," and was able to find some great coins even before the show started! These are all the coins I found before and during the show: After I finished all my buying on Wednesday and dropped my bags off at security, Rick and I head out to the Horseshoe Casino just down the road from the convention center. I ended up doing pretty well, so we had a nice dinner at their fantastic steak house, then it was back to the hotel so I could be sure to get up early for set up which started at 8am. Thursday morning came way too fast! I headed over to the show which was located in a different hall, luckily right across from my hotel, and the lobby was packed with hundreds of dealers waiting to get in. Set up went quickly, and I was able to do more buying for my customer want lists before the show opened at noon to the public. I took these photos before the public was let in. At noon, there was quite a line of public who began streaming into the show. A dealer who knows I collect encased pennies brought this really nice 1909 encased Lincoln cent from Chicago, which I didn't have in my collection. A gentleman came by my table and handed me a baggy containing this Lincoln cent bar of soap. I was pretty busy when he stopped by so I didn't even get his name, but that was really nice of him! I brought a bottle of Cab from one of my favorite Solvang vineyards, Bella Cavalli, and opened it on Thursday afternoon when things slowed down. It was a nice way to wind down the show. i Even with a decent crowd, Thursday seemed slower than usual for this show. I had some decent sales but there just didn't seem to be the typical buzz for the first day of a show. After the show on Thursday, we met up with our group for some drinks and I ran into one of my favorite hunky dealers, Dino! Then we all squished into an Uber and headed over to one of the best restaurants in Little Italy, DiMimmo's Ron picked out a wonderful bottle of Ruffino Chianti - between the five of us, it didn't go very far so we ended up ordering another bottle! Everyone enjoyed the dishes they ordered. I had a chicken sorrentino with cheese and white wine sauce and it was delicious! We usually stop at Vacarro's for dessert which is right across the street from DiMimmo's but unfortunately, there was a power outage on just that street and it was closed! On Friday morning I looked out the window to see what the weather was like and was very surprised to see all this bright white snow along the street and on tops of the buildings! It was really pretty. I walked over to the show early so I could take care of some paperwork, and walk around the show some more. These are some amazing coins that were on display at the Stacks Bowers table - they will be in one of their auctions I believe at the summer Baltimore show in May. PCGS folks hard at work as usual! As were NGC and of course my bff Cindi at ANACS! Also, the US Mint was getting ready for the new 2019-W Lincoln cent sale - I ended up buying a few myself! This is Allie Byers who works for New England Auctioneers hanging out with the US Mint mascot! The Whtman booth always has friendly and happy people working the show! One of the foreign coin dealers with whom I attend our Black Olive dinner event with at each Baltimore show, Charlie, buys and sells shipwreck silver bars and he showed me this very cool silver bar he had just purchased.from the Dutch East Indiaman Rooswijk that he had just purchased. It was fascinating listening to Charlie explain about how the ship was discovered and the silver bars were recovered. Here is a write up from New World Treasures about this shipwreck: "The Dutch East Indiaman Rooswijk, under the command of Captain Daniel Ronzieres, was lost on December 19th, 1739 after striking the treacherous Goodwin Sands off the South East coast of England in a heavy storm. The ship had just departed the Dutch port of Texel the previous day on her second voyage to the spice islands of Indonesia, carrying a large quantity of Spanish silver intended for trade and payroll in the Dutch East Indies. She sank with the lost of all hands. The shipwreck and her treasure was discovered 265 years later by Ken Welling, a British carpenter and sport diver, while swimming over the area in 2004. Salvage operations, conducted under the supervision of archaeologist Alex Hildred, has produced vast amounts of Spanish pillar dollars, cob coins, and silver bars most of which were returned to the Netherlands government." Al and Karl - my other foreign coin dealer friends who are part of our Black Olive event (I'm sure they are smiling because they were thinking about how much fun we will be having that night at the Black Olive!) Overall, Friday was even more slower than Thursday. I had spurts of being busy, but there just wasn't very heavy traffic throughout the day. I'm guessing the weather had something to do with it. But soon it was time to head out to the Black Olive for our wine cellar dinner event! For those of you interested, here is the history (from their website) behind this amazing restaurant: The Black Olive History "The Black Olive Restaurant sits in quaint elegance on the cobblestone section of Bond Street in old Fells Point. Though the restaurant itself is only a few years old, the spirit from which it springs holds a story that stretches through multiple generations. The restaurant is owned by the Spiliadis family, whose passion for food as art is grounded in a basic aesthetic principle: cook your food with an eye towards simplicity and tradition, and use only the finest ingredients, no matter what it takes to find them. The story of the Black Olive begins in Northern Greece, over a century ago, when a family who for generations had been notorious for their good cooking and unabashed hospitality, made a trek to Istanbul, Turkey, where many Greeks were living and doing business. The family built a hotel and restaurant on the coast of the Black Sea, and the business bloomed. The stories of those days, at the turn of the century, are still conjured up at family gatherings, and one can imagine the bustling city of Istanbul, a crossroads of culture and history, the busy hotel and restaurant, the sea, the smells, the laughter and shouts echoing. One story tells of how the sea became rough one day, as a storm approached, and as the waves became higher and higher, fish suddenly began to be hurled onto the beach by powerful waves. Everyone rushed down to the beach gathering as many fish as they could hold, carried them up to the hotel (for it was common knowledge that no one could prepare a fish better, and commenced with a feast and celebration that lasted for days. When the Greeks were forced out of Turkey in the 1920’s, the family moved back to Greece, and eventually opened up a taverna in the city of Patras. The notoriety of Spiliadis cooking continued and grew, and many of the same recipes used at the Black Olive Restaurant today were cultivated and honed in those years. In 1956, Stelios Spiliadis, the grandson of the original Istanbul hotel owners, came to New York to attend Columbia University, where he studied philosophy, working at the Sheepshead Bay restaurants, waiting tables to pay the rent. After graduating from Columbia, he moved to Baltimore to attend Johns Hopkins University, and when a pretty young librarian there charged him for an overdue book, he offered to take her out on a date instead. She agreed, and before too long they were married. In 1967, Stelios and Pauline had their first son, Andreas, and in 1970, Dimitris came along. Stelios’ younger brother, Costas, had also come from Greece to Baltimore, where he stayed for a while before moving to Montreal, Canada, to attend McGill University. Stelios became a social worker and Pauline continued working in libraries, but Costas decided to carry on the family tradition and opened up the now famous Milos Restaurant in Montreal. Stelios and Pauline, meanwhile, honed their cooking skills at private parties thrown for any and every occasion, and their friends continually urged them to open up a restaurant. The spark of this idea intrigued their youngest son, Dimitris, and during the summers of his college years, he interned at his uncle’s restaurant, learning the trade and getting his feet wet in the business. It was his early initiatives that would serve as the catalyst for what has become the Black Olive Restaurant. Renovations In Fells Point In 1994, Dimitris renovated a row house in historic Fells Point, finding out as he uncovered layer upon layer of wallpaper and floor tiles that the house was over two hundred years old. The project caught the interest of the whole family and soon the idea of renovating a nearby row house on Bond Street to turn into a restaurant became a reality. In March of 1997, the renovations of the Original Fells Point General Store was complete and The Black Olive opened it’s original 35 seat Greek Fish Tavern. Pauline, Stelios and their son Dimitris began to make a name for themselves by serving only the freshest food. The rest, as they say, is history." We started upstairs with some wonderful white wine while we waited for everyone to get there. Then we headed down to the cellar where our host had chosen several different wines for us. Even though I have only been attending this event for about 5 years, several others in the group have been going there for at least 15 years, so the folks who work there know just what wines to have ready for us. We started off with homemade pita bread and this tray of various dips, as well as a few plates of their specialty - octapus (forgot to take a photo of their very yummy octapus). This is Dimitris who took care of us the entire evening. What a very charming, knowledgeable, hard working young man! Here are some of the wines we had Except for me, they are all "dark siders"! ;-) Even though she too was a dark sider, for the first time, we even had another female join us! The menu had changed from the last time we were there, but not the quality of the food - it was all so good that I forgot to take photos of some of the dishes! Dimitris was showing us some of the wines that had been there for a while and brought out this amazing bottle of 1990 Ridge from it's original crate. It was $250 a bottle, and I remember having this same wine several years ago when we would do wine tasting dinners in Long Beach with Alan Kreuzer, my coin and wine mentor (but it didn't cost $250 a bottle back then!). Any way, we drooled but decided it was a bit too much, so Al very graciouisly treated us all to that wonderful bottle of wine! Their specialty and most popular dessert is their delicious homemade baklava ice cream - which is what everyone had! Dimitris also treated us to the wonderful dessert wine - it had a hint of butterscotch flavor too it. It was so amazing that I went online and bought 4 bottles right then and there! They're due to arrive any day now - I can't wait! What an amazing evening of great food, amazing wine, and wonderful friends!!! Not surprisingly, after a late evening like we had, with all that fantastic wine, Saturday morning came too early and I took my time getting to the show. Saturday was typically slow but I actually had a very good day sales-wise. I even went through my inventory and was able to sell a nice group of "stale" material to another dealer which helped clear up some space in my double row boxes for all the new material I bought. Soon it was time to once again pack up and head to the airport. All in all it was a successful show for me in spite of the lower attendance. But whether it's a good show or a slow show, I always enjoy Baltimore's amenities and Whitman does a great job putting this show together and trying to keep all the dealers happy! As I mentioned, I was very lucky that I didn't have any flight issues, but it was a long day and I was very glad to get back to my own bed. Since my hubby was away on a trip to Thailand with a friend, my neighbor was taking care of the kitties. Both my sweet Penny (and her mean sister Sierra) were eagerly waiting for some scratches on the head and more food in their bowl. Next up: Buena Park show this weekend, PNNA Tukwila/Seattle next weekend, then the ANA Pittsburgh NMS the end of the month! Charmy's January/February 2019 LONG BEACH SHOW REPORT w/lots of pics! Thank you all, it was a tough but good week going through everything. It brought some tears but more laughter and several "OMG I remember that!" outbursts. We started out each morning going to breakfast and talking about our parents, our old stomping grounds, what the plans were for the day, etc. Then we ended each day going out to dinner, having some drinks, toasting our folks, and laughing at what we had found. Now we just have to figure out where to put all the goodies we each brought home! My brother still has the biggest job - he's going to electronically scan all of the pages of the various photo albums, as well as many of the old loose pictures we found, and distribute the scans to each of us. He lives in the Seattle area, so when I'm up there next month for the PNNA Tukwila show, I'll pick up the physical albums and photos and bring them back with me since my parents' Will appointed me the keeper of the family photos. First, let me apologize for the lateness of this report. I left for Oxnard the day after the show ended to meet up with my brothers and sister so we could spread my Dad's ashes out to sea as he wanted, and to spend the week cleaning out my parents' home where they lived since 1959. I just got back home and this is the first chance I've had to write up a show report. Needless to say, t's been a long and emotional week. But we did make some great finds in my folks' closets, some of which I'll share with you at the end of this report. Now back to Long Beach.... You know many of us are creatures of habit, and whenever I attend the Long Beach show, it seems this is even more true than for any other show I attend. I usually see the same faces, shop with the same dealers, and dine at the same restaurants - all of which I look forward to. So this report may seem a little redundant from past Long Beach show reports, but I will try to throw in some unique aspects as well. Taryn (Long Beach Expo) let me use a couple photos she had posted on Facebook. Thiis photo was taken while the Expo folks were beginning to set up for the show at the same time another show was still vacating the convention floor. Well, they obviously did a great job putting everything together and on time - I took this photo about an hour before we were let in for set up. So as usual, I arrived at the convention center early Wednesday well before the projected rain storm had arrived. Cars aren't allowed up the ramp until 11:30 so it usually takes quite a while for cars further down the line to unload. So since the line of cars waiting to get up the loading ramp was already long, I decided to unload the car at the bottom of the ramp and push my cart up the ramp (it only takes me one cartfull). I had my friend watch the cart, then moved my car to the parking structure. This is the ramp to the loading dock. While waiting to get inside, I chatted with my friend Al Weinberg who was first in line. Al has found me some of my best and more unique pieces of penny exonumia. As many of you know, he also has the most amazing collection of early copper, several pieces of which recently sold at the FUN auction. At this show, Al was displaying one of the most incredible pieces of numismatic history - a 1787 Brasher Doubloon. So while we're standing out on the loading dock, Al asks me if I want to see the Brasher Doubloon. I said "of course I do"! So he pulls it right out of his pocket and hands it to me. Wow! I was holding a $5.5 million piece of history in my hands. I asked if I could take a picture of it, and he said "sure." So he is holding this precious piece in his hands while I take pictures with my phone. We were let in at noon, and I quickly set up my booth. I noticed while arranging my booth that there was a computer on a stand right next to my table. It was there for anyone to run searches for specific coins. I wasn't sure exactly how to use it but thought it was a helpful idea. As soon as I finished setting up, I walked around the bourse so try and fill some want lists. I have a couple customers putting together a toned Indian cent registry sets. One customer has allowed me to find every one of the coins in his set and I am proud to say that he is currently No. 1. I found him a beautiful 1877 in PCGS MS65 BN at the FUN show which really helped boost his score. And this pretty 1905 is another one I found for him at this show. These are the rest of the coins I found throughout the show, including a very pretty 1856 Flying Eagle that sold before I even left the show! As usual, when things died down, I opened a nice bottle of wine. This Bella Cavalli is a very nice red from a vineyard in Solvang (Santa Barbara County). Soon it was time to pack up and head out to dinner. Our usual Wednesday night spot is Cafe Piccolo's with the same dealer friends. But this time, my dear friend Ron Guth also joined us! We shared a nice variety of wine, and Joanne and I had our usual very yummy goatcheese chicken dish! When I arrived at the show on Thursday, it wasn't yet raining, but it didn't take long before the thunder and lightening and downpoor began. The thunder was so loud it sounded like explosions! At 10am when the show opened, there was a good crowd at the front door streaming in (photo courtesy of Long Beach Expos) However, overall the attendance on Thursday was less than usual, most likely due to the heavy rain - since as many know, we here in SoCal don't know how to drive in the rain! ;-) So I took a few minutes to walk around the bourse and take some photos. David and the busy folks at PCGS The Brasher Doubloon and early copper display was right next to the PCGS table As was the stunning Perfection collection of proof Morgan dollars These two PCGS folks were "guarding" these amazing collections! NGC was also very busy during the show These photos of the bourse were taken from my table in the middle of the room later in the day on Thursday Forum member Aspie Rocco stopped by and bought a few Lincoln cents for his collection and allowed me to take his photo for my show report. It was very nice meeting him. I also ran into my hard working good friend Shae who runs coins to dealers who can't get away from their table - like me! My other bff Cindi stopped by and gave me this wonderful smelling black cherry merlot soap and hand sanitizer, which is a must-have at coin shows! Thursday night is always rib night with a large group of dealers at Naple's Ribs! This time, I was pleased to have some good friends from San Diego (who started out being customers) joined us for dinner - Mark and Lynne (they are seated next to me and my booth helper Rich). Even though this is a large dish of ribs and brisket, please know that we make 4 meals out of this one plate since I take 3/4 of it home and my hubby makes several meals out of it over the next few days. It's one of his highlights of me attending the Long Beach show! Friday was a beautiful day with a nice break in the rain, and we thought it would help bring more people to the show, but unfortunately it was pretty slow, and attendance seemed down. It didn't help that there was another event at the convention center which filled up the parking structures so people had to park across the street. I still had a steady flow of people looking, asking questions, showing me their pennies trying to find out if they had something special, and even customers buying some Pretty Pennies! Forum member Original Dan had contacted me about how his daughter was getting into collecting pennies, and said he might stop by, so I had gathered a baggie of wheat cents to help her get started. Down the aisle from me was a dealer with a corner booth that had more coins in flips simply piled on his table than I had ever seen before! It looked like a sea of coins! There was also a large table at the front of the room with a great selection of vintage movie posters. Al Weinberg also stopped by and brought me a couple more encased pocket mirror pennies to add to my collection. I really enjoy finding pieces that I don't already have in my collection. Speaking of Weinbergs, Fred dropped by and gave me this very cool old Flying Eagle, Indian, and Lincoln cent error booklet that he had acquired in a collection - thank you again Fred! Later that afternoon, I opened up a bottle from another one of the vineyards I belong to. This nice Syrah is from Hawk Watch which is a SoCal vineyard in Warner Springs (Southeast San Diego County). After the show closed on Friday, we went to our regular Friday night dinner spot - King's Fish House - which is just up the street on Pine and a popular dealer dining spot. I'd say there were no fewer than 20 dealers having dinner there Friday night! And of course, we shared some amazing wines! And I had my usual macadamia nut crusted halibut, which is so delicious! Saturday opened up rather quietly, but soon there were several families with several young numismatists stopping by looking for pennies to fill their sets. I was honored to fill the last hole in a young man's Lincoln set, and when that happens, I hand out a special certificate and one of my copper coin cards to congratulate them for finishing their set. And surprising for a Saturday, I had my best sales day of the show! Overall, the show was on the slow side but I think it was due to many factors as I mentioned above. Soon, once again, it was time to start packing up and head home. Luckily the rain had subsided by the afternoon so I didn't have to worry about loading up in the rain. As always, it was nice to come home to my hubby and my sweet Penny! This is a photo from a couple years ago when Penny was a bit littler! So, as I mentioned earlier, the day after Long Beach ended, I drove up to Oxnard to scatter my Dad's ashes and to work with my siblings to clear out my parents' home - the home we were all raised in. My brothers were in charge of clearing out the garage which was a HUGE endeavor since my Dad never threw anything away. We had rented an industrial sized dumpster which, due to the amount of metal being disposed of, had gotten so full it had to be dumped twice. My sister and I were in charge of going through the house, which was quite a chore as well. But we found some real treasures and things from our past that brought back fond memories. We found a couple of early group photos of my Dad's various units in the Navy, including these. The first one we think was taken in early 1940’s in front of a F4-U Corsair airplane - my dad is sitting front and center. The second one was taken we think in mid 1950’s - my Dad is 4th from the left 1st row. Very cool pics of my dad!! But for me, the biggest treasure of all was a photo album my Dad had put together during his time on Pearl Harbor. Although we have seen a few photos of him on Pearl Harbor, we had no idea they came from an album with probably 50+ photos of him and his buddies romping around Hawaii. We couldn't see any photos with damaged buildings, equipment or airplanes so we are guessing most of the photos were taken before the attack but some could have been taken later as well. He also had many friends sign his album starting in 1942 all the way through 1945, and many left a personal note for him and printed their address too. He even had pictures of some Hollywood folks like Shirley Temple, Dorothy Lamour, and others. I don't know if he took the photos or they are stock photos. Then the second half of the album were photos of his family, my grand parents, etc. Again, we've never seen these photos before and were just amazed they existed. Following are pictures I took of just the signature pages and some of the Pearl Harbor pages. I also found my Dad's officer's hat which I took home with me. My niece and her husband came up on Wednesday since they were taking the old family jeep back to San Diego with them. My Dad bought his 1953 Willy from the military right after the Korean war and modified it quite a bit so he could take all us kids camping in the back of it while hauling our trailer. I even found the pink slip and original bill of sale - my Dad bought it for $300 in 1957. This was the most sentimental thing our parents left, and we are grateful it will stay in the family. It took my brothers and nephew about 4 hours just getting the wheels to turn since it had been probably 20 years since it last ran. Then Thursday morning we went gathered at the end of the Port Hueneme pier to scatter my Dad's ashes. It was a perfect beautiful crisp sunny morning as we watched his ashes wash out to sea off the coast of Ventura County just as he wanted. I am grateful that my brothers and sister and I were able to do this whole process together, it would have been so hard doing it alone. But I have to say, by the time we finished and we each went our separate ways, I was exhausted and so glad to be home in my own bed. Now that the hard part is over, we can move on with selling the house and finalizing the estate. But my siblings and I have made a pact that, even though we live in different states, we will get together for at least one weekend every year to honor our parents by not letting our family drift apart. So that's it for now. Next up: Baltimore, Buena Park, PNNA Tukwila (Seattle), and NMS in Pittsburgh - all next month! Charmy's 2019 FUN SHOW Report with Lots of Pics! Having had a 6-week hiatus away from shows, I was REALLY looking forward to the FUN show. For me, it's always been the best show of the year, both buying and selling. And this show did not disappoint. I've read a few reports with mixed reviews, but based on my personal experience at this FUN show, it was super busy and very successful. On Wednesday I did most of my buying, and on Thursday, I never even left my table until 5pm. Friday was a little slower than Thursday, but still had very steady traffic. As you all know, since I specialize in copper, I personally can't gauge how the market in general is doing. I can say that based on my sales, quality Indian and Lincoln cents are still strong and popular, but early copper seems to have flattened over the last year. But if you're looking for what's going on in the coin market as a whole or reports on how bullion was selling, perhaps you may want stop reading here. In this report, as usual, you will see pictures of my "nasty wine, while eating whatever," along with pics of the "lights of the city," and of course last but not least "how pretty my coins are." You'll also see pictures of some of the educational exhibits at the show, some of the forum members who stopped by, some of the faces behind the grading tables, photos of the bourse floor in general, and more. So if you're just wanting to be entertained and follow along my adventures at this coin show, then sit back, grab your favorite glass of nasty wine or other beverage, and read on! I left chilly but sunny SoCal Tuesday morning. As usual, we took off from John Wayne Airport heading west over the ocean, then turned back and headed east. The view of Newport Beach and the coastline is always breathtaking from the sky. I connected through Houston, then finally landed in Orlando Tuesday night. Rick had arrived on Monday and had rented a car so he was kind enough to pick me up at the airport. After I checked in to my hotel (one of the many "Rosen" hotels in the area), we walked across International Drive (right past the famous upside down house) and grabbed a bite and drinks at one of the local pubs, and listened to some great music. The next morning (Wednesday) after sleeping in a little, we grabbed breakfast then headed over to the convention center to view some auction lots and do a little business before the bourse opened for dealer set up. By the time the doors opened at 2pm, there was a huge crowd of dealers waiting to get in. I set up pretty quickly, and it wasn't long before my usual vest pocket dealers began stopping by to show me their Pretty Pennies. I also took a few minutes to hit some of my favorite dealer tables to see if I could fill some want lists. Wow, I found some fabulous and scarce pennies at this show, including an 1888/7 in PCGS F12, a beautiful 1877 in PCGS MS65 BN, a unblemished 1914-D in PCGS MS64 RD, and a colorfully toned1916 MPL in PCGS PF66 RB! I also found more than the usual number of quality Pretty Pennies throughout the show. Here are a couple pics of the bourse floor taken from my table (1025) during set up (that's Rick's son Kenny in the dark red shirt photo-bombing my pic!) After things settled down later in the afternoon, I opened one of my very favorite "nasty" wines that I had brought with me - Rombauer Cab! My buddy Neal (retired FBI now coin dealer) happened by and shared a cup with me. After set up was over, a group of us headed over to Charley's Steak House on International Drive for an amazing dinner! It is located right across from the very scary looking Starflyer ride which is all lit up at night and changes colors. Charley's is rather pricey but I can't say I've ever had a better steak! And their lobster bisque was full of tasty chunky lobster. Of course we had some great wine too! They have a huge wine selection - this bottle of Rodney Strong Cab was one of their featured wines and it was so amazing that we had two bottles! The show opened to the public on Thursday. I was non-stop busy from the moment the public began streaming in until 5pm when I had to leave for a meeting. It was great to be so busy that the day just flew by! Again, these are photos of the bourse taken from different directions at my table location. Dave/DPoole took a moment to stop by to say hi I also picked up a couple of nice penny pocket mirrors for my collection, including a couple that John Kraljevich had set aside for me. John also sold Rick Snow these two original letters from the designer of the Indian cent, James Longacre. They were written shortly before he died. I also bought this very cool Christmas postcard that would be given out with a penny tucked inside the tiny envelope that is glued to the inside of the card. After the show ended, six of us headed over to PF Changs - I know it's a chain, but when you're in the mood for Chinese food, you can't go wrong with PF Changs. Our table was filled with lots of great and varied dishes! And what goes better with Chinese food than a very tasty refreshing Mai Tai! Knowing that Rick and I are huge Game of Throne fans, during dinner Neal presented both of us with actual rocks he picked up from one of the castles in Dubrovnik, Croatia, where Game of Thrones was filmed! Although Friday wasn't nearly as busy for me as Thursday was, it was still steady and I had good sales throughout the day. A few more forum members stopped by to say hi. Bill/Ponderit Bob/Watersport and his friend Dave Brian/Wabbit2313 And Mel At 1:30, I headed over to the Fly-In Club meeting. Chris Pilliod gave a fascinating presentation on the various Indian cent errors he's collected over the years. He really had some amazing errors, including a rare triple struck Indian cent and this very rare V nickle struck on an Indian cent planchet. After the meeting before I went back to my table, I took a few pictures around the bourse floor. These are the very busy and hard working folks at the PCGS table And here's a picture of my bff Cindi Another pic of the bourse at the other end of the room from my table That night the "Coin Dealers Helping Coin Dealers" group held a reception/meet and greet at Maggiano's. It was a really nice gathering of probably over 100 people. They served all kinds of hors d'oiuvres with a cash bar. Rob Oberth works does a great job getting everyone together and managing this group on Facebook. They also gave out a nice souvenir half dollar. That's Rob on the right Here are photos of the various folks who attended After the reception, we stayed for dinner at Maggianos They had a special on another of my favorite wines! Saturday morning I had to get up early for an 8am Women In Numismatics board meeting, followed by our general meeting. We had a really good speaker, Jim Zylstra, who gave a presentation on "bride-price" in primitive money. It was a fascinating talk on a very unusual numismatic topic! After the meeting, I decided to peruse the educational exhibits. The FUN show is known to have some very competitive and well-crafted exhibits. Here are just a few of the exhibits - I don't know which exhibit one as it wasn't announced until later on Saturday. This is Paul working the NCS table Even though they were swamped, the folks at the NGC table were very kind to take a few minutes to pose for this photo! And of course here's my bff Cindi working at the ANACS table, along with her co-hort Matt! After the doors opened to the public, the bourse filled up nicely, though there were many more folks "just looking" or there to ask questions or get appraisals. Soon it was time, once again, to pack up everything and start my long trek back home. Knowing there was a huge snow storm hitting most of the mid and eastern U.S., I was a little worried about delays and flight cancellations. I was returning through Chicago and I had faith that Chicago knew how to handle tough weather. Even though my flight out of Orlando was delayed, it took off in time to get me to Chicago for my connection to Orange County. Bye-bye warm sunny Orlando, for now! However, when we arrived in Chicago, it was still a bit of a nail-biter because we were stuck on the tarmac waiting for the plane at our gate to get de-iced before it could take off. I had only 20 minutes to make it from the C terminal to my gate at the B terminal and I had to lug my heavy bags with him as I hurried to my gate - I was one of the last people to board my flight! But I need not have worried because we were stuck at our gate for quite a while before we took off because our plane had to be de-iced, and several planes ahead of us getting ready to take off also had to be de-iced. However, I again began to get a little concerned about my flight because the John Wayne Airport has a curfew and if an incoming flight gets there past 11pm, they are diverted to LAX which is over an hour away from my home (whereas John Wayne is only 10 minutes away). But even with all the delays, our flight crew managed to make up time and landed at John Wayne at 10:30pm! YAY! My hubby was out of town at our place in Lake Havasu when I got home, so I only had my grumpy Siamese kitty Sierra (who ignores me) and sweet Penny waiting for me at home! Both were very ho-hum about me arriving home because I was disturbing their rest! Next up, the Long Beach show the end of January! Thank you all for the very kind and uplifting comments. I read every word each of you wrote at least twice. Your thoughts and sentiments are very comforting, it really does help having the support of family and friends. And though I may not have met each of you in person, I consider you all my friends. Thank you. There still isn't a day that goes by where I don't get teary-eyed thinking about my Dad being gone, wanting to hear that "I love you more" one more time after I would tell him I loved him. But each day it's slightly less painful missing him. As trustee and executor, I have just begun the process of settling my parents' estate and have already met with a couple "technical" obstacles that will keep me busy for quite a while. Fortunately, my parents had a Trust and everything was clearly spelled out. And since we all had great respect for our parents and my parents were very fair, I know there will be no issues with my siblings. Again, thank you all for being so supportive and comforting, it truly helps. I realize there are a lot of terrible things going on in the world right now, but my own little world was recently shattered and my heart broken because my hero, the man I looked up to most in my entire life, the man who taught me integrity, hard work and respect, the last link to my childhood - my amazing dad - has died. (Ok, my hubby comes in a close second.) My dad who was 97 and one of the last few Pearl Harbor Survivors passed away just a few days before I left for the Portland PNNA show. I tried really hard to keep it together during the show, but at times it was hard because every time some kind person would come up to me to offer condolences, I would get choked up and couldn't speak. But I got through it and even managed to take a few photos for a short report. Wine helped. Then I went straight from Portland to Baltimore and had to do it all over again. Although being at these coin shows was a good distraction, it was still hard to keep from tearing up every time someone offered their sweet and heartfelt condolences. Again, wine helped. So although I was preoccupied and really wasn't into taking photos for a show report, I managed to take some pictures, admittedly the photos were mostly of the social aspects after the show. So, if you don't mind, at the end of this show report, I'd like to do a special tribute to my dad. I've been participating in this forum for so many years that I feel you are all a part of my "community." And although it's hard, I've found it has been cathartic and comforting to talk/write about him. But first, the "show" reports. As I was going through the photos I took, I realized that most of them are from our dinner outings after the show with not many taken during the show. I apologize for these reports not being very coin comprehensive - I think this was because I found it easier to just work behind my table rather than take the chance of breaking down in front of more people around the show. So I left beautiful sunny Orange County for Portland on Friday morning. I was actually looking forward to seeing some rain, but when I arrived in Portland, the weather there was about the same as what I left in Southern California - it was gorgeous! Since set up wasn't until 3:00pm in my same time zone, it was nice to be able to fly in on the same day the show started. I believe this is Mount Shasta I checked into my room at the Doubletree where the show was held. The room where the show is actually held is across from the entrance to the registration. After I set up my booth, I opened a nice bottle of Columbia Valley wine. After the show was over on Friday, West Coast Coins and The Portland Mint hosted dinner for members of the Facebook group Coin Dealers Helping Coin Dealers (CDHCD) at Stanford's Restaurant right behind the Doubletree. It was a great evening of camaraderie among the dealers and a nice way to meet and chat with new dealers you might not have previously known. A big thanks to Revick Galstoun (West Coast Coins) and Adam Young (The Portland Mint)! They had a nice menu to choose from, including these delicious ribs! The next day, Friday, was quite busy with a good amount of public attending this show. Since I had sold quite a bit of raw Lincolns at a prior show, one of my goals was to replenish my raw Lincoln cent inventory which I was able to do at this show. I also found a complete Lincoln cent set, as well as a few certified coins to add to inventory. I also bound a couple of pieces for my exonumia collection, including this really nice encased 1908 Indian cent from Niagara Falls I received a surprise visit from this young couple who recently moved to Portland from Orange County. They are my sons' childhood friends. Max and my sons have known each other since they were five years old. After the show on Saturday, we went to our favorite Portland spot, Jake's Crawfish, which I believe is the oldest restaurant in Portland. They have amazing food and we absolutely love it! On Sunday, there was still a fair amount of traffic at the show and it was busy all the way through early afternoon. I took a couple pictures around the bourse floor including the collector exhibits. While I was walking around taking photos, my bff Cindi had brought a birthday cake and set it out on my table which caught me by complete surprise! (fyi, my birthday wasn't until the next week during the Baltimore show but we wouldn't be seeing each other then so she celebrated my birthday a little early.) Since I was leaving for the Baltimore show directly from Portland, I stayed one more night at the Doubletree in Portland. And Cindi and Steve were also not leaving Portland until the next day so we got together for dinner at the hotel. She again surprised me at dinner with a birthday cheesecake which we shared with the other patrons at the restaurant! And the bar was having a special on "Fruit Loop Martinis" so of course we just had to try one! They even had crushed Fruit Loops on the rim of the glass! Overall, the Portland PNNA show was pretty busy, and I was fortunate to find some nice coins to buy as well. Let me just add that it has been my experience that the dealers at this show are particularly friendly. And Scott Loos and the rest of the staff who put it all together and make it run as smoothly as it does are extremely nice and helpful. I really enjoy attending this show, and look forward to next year's show! Monday I spent most of the day flying from the Pacific Northwest to the Northeast! It was a long day! I left beautiful sunny Portland late Monday morning. After spending a couple hours in Dallas, I finally arrived in Baltimore about 1am and checked into my hotel room. On Tuesday morning, I went to one of the dealers who were set up in their hotel room showing coins and bought a great group of coins. I then went back to my room and began working up all the raw coins I had bought in Portland so I could have them ready during the Baltimore show. Later I grabbed a bite to eat at the hotel restaurant, then called it an early night! On Wednesday, I dropped off my coins at security, then headed to the Horseshoe casino for a few hours since it was only a couple miles away from the convention center. They had a new type of poker game out in the blackjack area called "CrissCross." It was interesting and I ended up doing pretty well. Set up day began Thursday at 8am. Set up day was surprisingly not busy, although I did manage to buy some more coins. These are all the coins I bought during the Baltimore show: Including these two scarce beauties: 1873 Double Liberty PCGS MS64 BN 1916 MPL PCGS PF66 RB When I was leaving the show on Thursday, I looked around and saw all the chairs on top of the tables and was reminded of the joke "how to you tell when a coin dealer is on vacation?" "From all the chairs on top of his house!" ha ha ha! Thursday night we went to one of our favorite Baltimore restaurants, Da Mimmos, in Little Italy. I had an amazing lobster on linguine along with same even more amazing wine! After dinner, we walked across the street to world famous Vaccaros for a "little" dessert. I can't even describe how many desserts they have on display when you walk in, and when you order one off the menu, they give you enough for four people! Little Italy is a fun area of Baltimore, with some great restaurants. Here are a few photos I took around Little Italy On Friday, there was a big storm in the northeast and the show started out a little slow but soon it picked up. I was honored to have the Bressetts stop by my table to say hi. It happened to be Ken's 90th birthday! It was also Dave Bowers' 80th birthday. Both of their birthdays were celebrated at Morton's Steakhouse (I was not there so I borrowed these photos from Jeff Garrett.) I did manage to get around the bourse and take a few photos of some of the usual hard working suspects! PCGS NGC And that's Todd Pollock/BlueCC Photos in the background! Friday happened to be my actual birthday and, even though it was a pre-planned event, I was really looking forward to spending my birthday at our usual Friday night restaurant at the Black Olive restaurant in Fells Point, with my "dark side" friends. This is the restaurant where we get to dine at the one table in the wine cellar surrounded by hundreds of bottles of amazing wine! Unfortunately, I only remembered to take a picture of the white wine we had upstairs before we went down to the cellar, where we usually have several different types of red wine, followed by a wonderful dessert wine. I did remember, however, to take pictures of some of the dishes from their new menu, including an entire fish - ugh! This is one of everyone's favorite dish at the Black Olive, the octopus! Saturday was still raining and the show was excruciatingly slow but I did manage to have a few decent sales before it was time to pack up and head home. By Saturday, I had been on the road over a week and was very tired and emotionally exhausted. I was very much looking forward to getting home especially because my dad's memorial service was set for Sunday afternoon in my home town. This year I have had several flight mishaps and with the rain storm in Baltimore, I was getting a little nervous about making it home in time. But all went smoothly and I arrived home late Friday night, exhausted, but with no flight issues whatsoever. Someone was smiling down on me! It was wonderful to be home with my hubby and of course, my chubby little Penny! Again, I apologize for the weak and sparse show report, my heart just wasn't in it this time. But now, I hope you will bear with me as I post this tribute to my Dad..... My heart broke the day my Dad died. He was 97 and lived a very full life. He was a Pearl Harbor survivor, a husband, father, grandfather, and great grandfather - but most of all he was my Dad. I loved him so very much. He was a strong, caring man and so kind with a big open heart. He was always there when I needed him, he was my hero. My Dad loved camping, hunting, and road trips around the country with his family. He showed me the beauty of nature and the majesty of National Parks. He taught me how to shoot a rifle, reload bullets, change the tire, oil, and radiator water on my car. He taught me to have integrity, be honest, work hard, and to always do the right thing. My Dad told me he loved me often and always made me feel loved. My Dad grew up on a farm in Michigan. His parents were humble and poor Polish immigrants. In order to help out his family, he tried to enlist in the Navy when he was 17 but the Navy found out and sent him home. He returned when he was 18, and at 20 he found himself stationed on Pearl Harbor as a Naval fireman. These are photos taken of my Dad before the attack on Pearl Harbor He was on duty, driving a firetruck to the dock where the oil tanker USS Neosho was pumping gasoline and other fuel into Ford Island fuel tanks when the attack began. He was interviewed for the book "Day of Infamy" by Walter Lord, here are excerpts from that book: My Dad's local newspaper also interviewed him two years ago on the 75th anniversary about what he was doing during that fateful day. Here's a link to that story https://vcstar.com/story/news/local/communities/oxnard/2016/12/06/pearl-harbor-survivor-oxnard-all-hell-broke-loose/94248250/ This is my Dad, me, my son, and my son's son. These are my siblings, and my Mom and Dad (my Mom passed away 5 years ago) So Sunday we headed to the home in Oxnard, California, where my parents lived since 1959 and where I grew up. We decided to hold the memorial service there, including the military honors. A video of the 21-gun salute and taps portion of the ceremony https://facebook.com/1103900460/videos/pcb.10213171372134594/10213171339773785/?type=3&theater This is a photo of our family and friends taken on Sunday at the memorial. The local newspaper was present at my Dad's memorial on Sunday. The story appeared on the front page of the Ventura County Star today. A link to the online story of his memorial https://vcstar.com/story/news/local/2018/10/29/pearl-harbor-survivor-oxnard-resident-dies-age-97/1810539002/ After the service, all of his children, grand children, and great-grand children gathered and reminisced about my Dad. One of the central things we all remembered and talked about was growing up with my Dad's jeep. He bought this military jeep right after the Korean war. He modified it to meet his needs, including adding a 440 Dodge motor, a heavy duty winch welded onto the front, a metal top and sides that he welded onto the jeep himself along with postal truck-type sliding doors, sliding tool drawers under the front seat on both sides, and small water tanks in the back on each side with outside spigots so we could get water or wash up. Then he threw in a featherbed on the floor in the back for us to sit on! He would pack us all up in that jeep, including our big dog, hitch up the trailer, and take us camping at least once a month throughout our lives. That jeep could go anywhere, and it did. I can't even tell you how many different colors that jeep has been painted over the years. This is the jeep now, along with my grandson who loves anything with wheels! This picture was taken of us in front of the jeep when we were kids So a couple years ago, we recreated that same photo We were all pleased and grateful when my sister's daughter and her husband agreed to take custody of the family jeep so we wouldn't have to sell it off or scrap it. My Dad was born in May and my brother recently came across this song that made him think of our Dad. It is called "the King of May." So during our reminiscing, we played this beautiful Natalie Merchant song for everyone to hear - it brought tears to everyone's eyes. Here's a link to the song https://youtube.com/watch?v=8kZ0vhee8j4 These are the lyrics "King Of May" Farewell today Travel on now Be on your way Go safely there Never worry Never care Beyond this day Farewell tonight To all joy and to all delight Go well and go peacefully We can't keep your majesty Be on your way Make ready for the last King of May Make a cardboard crown for him Make your voices one Praise a crazy mother's son Who loved his life Who loved his life Farewell today Travel on now Be on your way Can't bear the very thought That we could keep your majesty Be on your way Make ready for the last King of May Make a hole in the crowd for him Raise your voices up Lift your loving cups To his long life To his long life Make ready for the last King of May Make a hole in the sky for him Raise your voices up Drink your loving cups To his long life To his long life Thank you for bearing with me and allowing me to write this tribute to him. I know my Dad lived a long full life and how lucky I am to have had him with me for more years than most people get with their parents. I will miss him every day for the rest of my life. Charmy's September 2018 LONG BEACH SHOW REPORT w/lots of pics! Another Long Beach show in the books! This show, more than any other I attend, seems to fly by so fast. Maybe it's because I am usually pretty busy throughout the show, with a lot of my local regulars stopping by to see what new Pretty Pennies I have in my inventory. Also, having my booth buddies helping at my table is more fun than "manning" my table by myself! And the Expos folks really do work hard to make this a smooth show for the dealers, always walking around asking if they can do anything for us. I must admit that preparing my report of the Long Beach show is a bit of a challenge. That's because me and my "posse" have our favorite places to dine and each of us looks forward to going to the same restaurants we went to the previous show. And we often even order the same dishes at those restaurants! So my photos tend to show the same faces eating at the same restaurants having the same entrees! However, at least Ricko will appreciate that the wines are usually different! Wednesday was a beautiful hot sunny Southern California day. This beautiful photo of the Queen Mary is courtesy of Jeff Garrett. I arrived at the back of the convention center area on Wednesday morning as usual, waited to be let up to the loading dock, unloaded my car quickly, pushed the cart up the ramp to the back door, moved my car to the parking lot, then waiting for the doors to open at noon. By the time the doors opened, there was quite a long line of dealer cars waiting to be let up the loading dock ramp. This is a picture of the construction on the street behind the convention center where we wait. They recently built this walkway above the street and are now constructing a building on top of the walkway. After I set up my booth, I went over to view the Tyrant Collection and took quite a few pictures so you could see just how amazing this collection is - and there were even many more coins in this display that I didn't photograph. I also did a lot of my usual buying on Wednesday from various vest pocket dealers who stopped by my table. These are the new Pretty Pennies I bought throughout the show. After the show on Wednesday, we went to our favorite Italian restaurant, Cafe Piccolos, with my usual group, Karl, Joanne and Rich, and I had my usual goat cheese chicken and pasta dish. They also make a great Caesar salad! We also had some great wines! The show was very busy on Thursday, all the way until later in the afternoon. John and his wife Linda stopped by to sell me some pennies. They are also the couple who assembled this spectacular complete collection of 144 U.S. Commemoratives which is ranked as both the Current Finest and All-Time Finest in PCGS's set registry. At this show, several tables were reserved for various Olympic memorabilia dealers who began setting up their tables on Thursday morning. After things died down at my table, I was able to walk around and view some of the Olympic material. There were a lot of pins, posters, clothing, and other Olympic collectibles, but the most fascinating items were some of the torches used during various Olympic games, including the famous 1936 Berlin games. I was even privileged to be able to hold a few of the torches! This first one was one of the torches used in the 1936 Berlin games. The second torch was from the 1956 Cortina Olympics in Italy This third torch was from the 2008 Beijing Olympics Even though I believe this was a one-time thing, it sure was interesting and entertaining viewing some of these Olympic collectibles. Soon it was time to open one of the bottles of wine I had brought to the show. It was a new vineyard that had a high rating and I was anxious to see how it tasted. It definitely did not disappoint! Thursday night is reserved for Naples Ribs where many dealers gather in the back room and enjoy some of the best ribs out there! I usually order an extra large portion because my hubby would be very upset if I didn't bring him home some ribs and brisket! The doorway at the end of this room is where all the dealers dine. Here are some of my fellow rib lovers! Northern Nevada Coin folks Todd/BluCCPhotos and his dad, and Todd's uncle Curt My group More faces I can tell you my hubby was in heaven the next day when he heated up those ribs and brisket! Friday was slower than Thursday as is typical, but I was still busy and sold quite a few coins. We also heard that Security was very busy on Thursday with three different thefts reported, one theft included several notes, another was a stack of gold coins, and another was a money pouch that was on a back table where the thief reached across the table when the dealer was facing the other direction. They had some suspects in mind but I didn't hear of any actual arrests being made. Aside from travel mishaps, this is the most frustrating and infuriating part of being a dealer. We work very hard for what we have, building up our inventory to have the types of coins our customers are looking for, and these thieves just take the easy way out by stealing from us so they don't have to work! Geese, it just makes my blood boil. Any way, later in the day I walked around the bourse floor hunting for some coins on my customer want lists and took a few more photos along the way. This is Gary Adkins, ANA President, hard at work! Always friendly folks at ANACS! Always busy folks at PCGS! Always hard at work folks at NGC! This is the wine we opened in the afternoon. It's from one of the wineries that I belong to in Warner Springs which is in eastern San Diego County. It's a winery that is located up on a hill where several hawks make their home hence the name "Hawk Watch." This is a very decent wine and didn't last long as we shared it with several people. Friday night, we headed over to our usual Friday night spot, King's Fish House, which is just up the hill behind the convention center on Pine Street. We had a combined group of 10 people and 10 different bottles of some amazing wines, thanks to John Cox who brought the four bottles of Napa and French wines ! Needless to say, we didn't drink all that wine - we definitely had lots left over! I had my usual macadamia nut crusted halibut which is sooooo delicious! Several of us shared this yummy butter cake and homemade ice cream dessert I carpool to the Long Beach show with my booth helper Rich, and when we arrived on Saturday morning at the parking structure, it was packed with Comic Con participants since the Comic Con show was in the hall next to ours at the convention center. Getting out of the car that was parked next to me were these three guys all decked out in costume so I asked them if I could take their pictures, and they were happy to comply! It was a hoot seeing all kinds of costumed people on the streets all around the convention center! Business-wise, Saturday was very slow, with very few sales, though there were lots of people with their families and lots of folks who had questions about pennies they inherited, most of which were not very valuable. They had the usual kids treasure hunt which is always popular and fun for the young ones. As I mentioned, this show just seems to fly by because before we knew it, it was time to pack up and head out. It was a busy four days and I definitely enjoy being at the Long Beach show. But I always look forward to getting home to see my hubby and of course my rolly-polly Penny. This is a picture of our little Ryder playing with Penny just before I left for the show. Penny is such a gentle kitty and she usually lets Ryder "pat" her for a few minutes before she simply gets up and walks away. Next up: the Santa Clara show (9/20-9/23), the Buena Park show (10/6-10/7), the PNNA Portland show (10/19-10/21), and Baltimore (10/24-10/27). Bob, actually Rick Snow bought the very cool bat, not Rick Harrison (RH wasn't at the ANA banquet). I know RS put a large bid on the bat early on, and no one beat it. Bob and everyone else, thank you so much for the very kind comments, I’m really glad you enjoy my show reports. Although it takes a lot of time, I do really enjoy putting these travel blogs together as it Lets me relive all the fun and adventures I had. So sorry this report is a later than usual - in addition to watching my grandson which takes a lot of my time, I had some significant travel mishaps that delayed me getting home and just wiped me out mentally and physically. More on that later. Overall, the show was good, not the best show I've had for selling, but it was great for buying. Also, it is a fun city to visit and tour, with lots of wonderful and interesting historical sites to see. So grab a cup of coffee or other beverage depending on the time of day you read this, as there will be lots and lots of photos! So I headed for Philly the Saturday before the show so I could see some of the sites before the show started. This is me so very happy to be going to the Philly ANA! As many of you know we are having lots of wild fires out here in California, and as we flew out of Orange County you could see all the smoke from the hills in OC/Riverside that were still burning last week. I arrived in Chicago to make my connection to Philly, only to find out my connection was slightly delayed due to the storms over Philly. So I grabbed a drink while awaiting my flight. I kept getting updates showing my flight was delayed even further, first 15 minutes, then 1/2 hour, then another hour, then two hours. Finally, later than evening it was cancelled altogether. I immediately went to customer service and found they had put me on a flight going the other direction! There was another flight to Philly that was supposed to leave in an hour but I would have had to go stand-by which meant even if I got on, there wouldn't be any room left for my bags. So they put me on a 5:20am flight the next morning. I decided against getting a hotel room since I would have to be back at the airport around 3:30am, and just kept my room in Philly so I could go straight there and sleep for a while. But this meant that I would be hanging out at Chicago O'Hare for several hours. This is me not very happy about having my flight cancelled and spending the night in an airport. And this corner was my home for the night. I watched "The 60's" and "The 70's" on CNN, as well as several episodes of a tv show I had downloaded on my tablet. And this is what O'Hare looks like at 3am - who would have thought that it would be completely deserted! Finally, hello Philly!! So I got to my hotel around 9am on Sunday, actually met someone to do a little business, then passed out in my room for several hours. Then it was time to hit the city and see some sites! Rick, his son Kenny and I headed over to Independence Hall and passed the site where the First United States Mint building was. Then on to Independence Hall and the Liberty Bell The beautiful horsecart tours looked like a great way to see the city Then it was time for dinner - we ended up at the Hardrock Cafe This was the guitar and plaque right above our table It was so very hot and humid that this fruity tasty beverage was so refreshing - and I got to keep the souvenir glass! After that, we called it a night so I could catch up on my sleep! The next morning (Monday) was the PNG preshow so I headed over to the convention center. It was raining quite heavily so it was nice to have the walkway from the Marriott to the convention center, although it was probably three times as long as walking out the front door of the hotel. Although I bought several more coins throughout the show, I did the majority of my buying at the preshow. Here are photos of all the coins I bought throughout the week. Some of the highlights of my purchasers are these: I was thrilled to find a pretty 1895 red Indian cent in a rare Doily holder to add to my personal collection! I also bought my first Gold CAC stickered coin! And I found a rare Mint State (S-3) 1856 Flying Eagle in PCGS AU58! Although I know it's an uphill battler, I'm going to try and convince PCGS to put it in the correct holder. After the preshow, Rick, Kenny and I did some more siteseeing. We headed over to the Philadelphia Mint and took the self-guided tour. However, non of the machinery was working, but it was still very interesting. Here are some highlights: This was a roll of metal that coin planchets are punched out of After the Mint, we visited Ben Franklin's grave Next, I decided to peruse the famous Reading Terminal Market. What a fantastic place! It has every kind of wonderful food you can imagine! Later, I headed over to Morton's to attend the PNG awards banquet ICTA Executive Director Kathy McFadden received the PNG 2018 Significant Achievement Award PNG 2018 Lifetime Achievement Award was presented to Donn Pearlman Tuesday morning was dealer set up and there was quite a crowd of dealers waiting to get into the bourse The ANA did a lot of advertising for this show, including an ad on tv that I saw each morning before I left for the show. Here's a great article in the local newspaper about the show. After I set up my booth, a few more vest pocket dealers stopped by and I continued to add more Pretty Pennies to my inventory. I also perused the bourse for coins on my customer want lists. Then it was time to open one of the bottles of wine I had brought. This one is my favorite zinfandel! After the bourse closed for the day, it was time to board the buses for the ANA's kick-off event at the Museum of the American Revoluation. This is a relatively new museum, and it was absolutely wonderful! This is my "possee"! Kenny, Central States Numismatic Society President Mitch Ernst, Rick and Neil Me and ANA President Gary Adkins Me and NGC Research Director David Lange Looking down at the entrance Me. Susan Trask and Rob Oberth and look who else showed up at the event! Here are highlights of the museum exhibits The ANA handed out some nice goodie bags for all the participants Other folks recognized the Pawn Stars celebrity as well! I actually took a lot more pictures because there were so many interesting exhibits. However, I missed seeing Washington's field tent which closed before I could see it, and I am told that was the best part of the whole museum! After the museum, a group of us went to Maggianos for dinner - they had very yummy wine! Wednesday morning I had an early meeting of the ANA Dealer Relations Committee where we discussed various ways to make the hobby better for everyone, both dealers and collectors. When I got to the show I had a few extra minutes to peruse the ANA museum display. WOW, some amazing pieces! I also stopped by John Kraljevich's table to see if he had any "goodies" for me - whenever he finds some penny-related item he thinks I might like, he sets it aside for me in a small envelope. Well he had some great goodies just waiting for me! His mom used to collect the tiny teapots made from pennies and had decided it was time to part with them so he had those waiting for me. He also had a teapot from Norway, and Indian cent spinner, and a WWII Victory pin. But the best thing was this 1889 Indian cent locket containing a tiny photo of an old man. The inside was machined out and it had a couple of threads to twist the two parts on and off. When the two sides were screwed together, you'd never know it was two pieces. When I got back to my table, a couple of good friends were waiting for me - Larry and Linda Sekulich! Larry was the Summer Seminar instructor I took the exhibiting class from. They had stopped by to say hi and give me this very nice large copper replica of a 1909-S vdb Lincoln cent! A short time later a couple of forum members stopped by to chat. Frank/Treashunt Pat/PTVetter Ed Fuhrman also stopped by and showed me this very cool rare Indian cent on a dime planchet error. Even though it had been scratched on the reverse, it was still quite a pricey error. After the show on Wednesday, I headed over to the auction to see the Indian cents and of course the 1913 Nickel! 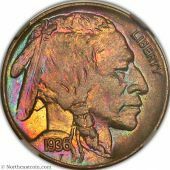 There were some great Indian cents in this auction, but the nickel was why the room was packed! It was a little bit of a let down because after all the introductory comments, the history, and the rules about bidding on the nickel, no one placed a bid on the nickel at the auction. The prior online bidding of $3.8 million was the final hammer price for the nickel. After the auction, we had reservations at the City Tavern, established in 1773. It was torn down in 1854, then the National Park Service rebuilt an exact replica in 1975. It was rebuilt "so that you may enjoy a 'taste' of the past and share the atmosphere of gentility and food cheer enjoyed by our nation's founders." The food was taken from recipes of the 1790's and included rabbit, venison, turkey, etc. This was a popular cider drink that was delicious! This was a description of the beer samplers they served These were just the appetizers! Sorry, but I forgot to take pictures of the meals - the food was delicious! And so was the wine! Thursday morning a few more forum members stopped by Mark/Sparky64 It had been a long time since I saw Broadstruck at a show so it was good to see him. Sorry, all you get to see is his hand! Dennis/DCW and Brian/Boosibri Cliff/Tootall (and Rick who was standing on his tip toes!) Larry Sekulich collects, among other things, ancient coins and he came by and showed me a couple of the cool pieces he bought at the show This is Mary Garrett (Jeff Garrett's wife), along with Rick from Pawn Stars, and of course Elvis was in the building too! At the end of the day I opened up the second bottle of wine I had brought. I was one that I bought in a case of mixed wines from a friend, so I wasn't sure how I would like it, but it did not disappoint! Thursday night I decided to give the Harrah's Casino a try. While I did okay at the table games, I couldn't get a head on the slots. Friday was a very busy day, not only business-wise, but I was giving a presentation at the Fly-In Club on "Penny Pots and Pins Made by Offenders and Defenders" which is about prison art and trench art made out of pennies. It seemed well received. My good friend Michael Hassler again won the PCGS Platinum Level award for his Lincoln Everyman's Set - Congratulations Michael! The bourse floor was still pretty active in the afternoon on Friday Ran into ANA Governor Steve Ellsworth and former ANA President Jeff Garrett Throughout the week, this wonderful young lady page was running around the bourse, taking and delivering beverage and food orders, delivering flyers, etc. The pages were not allowed to leave the convention center on their own to pick up food orders, so this young lady had her mom go with her so she could fill orders from the very popular Reading Terminal Market across the street! A favorite lunch pick by everyone, including me, was the Philly Cheesesteak sandwich from the market! Friday night was the annual ANA Awards Banquet where they also hold a silent auction. These are some of the items that were up for auction - the baseball bat was one of the highlights (Rick was the high bidder) Here are some faces from the banquet I am so pleased that several Women In Numismatics members won significant awards at the banquet! Cindy Wibker as the recipient of the prestigious 2018 Farran Zerbe award Prue Fitts received the Elvira Clain-Steffanelli award Mark Lighterman for the ANA lifetime achievement award Abby Zechman won Best of Show in the YN Division for her exhibit, and also Young Numismatist of the Year and Bob Fritsch received the Joseph Boling award for excellence in numismatic judging On Saturday morning I had my Women In Numismatics board and general meeting. At our board meeting we discussed holding some special events in the year 2020 - the 100th anniversary of the year women got the right to vote. We plan to call it "The Year of Women In Numismatics" and plan to have give-aways, educational programs, presentations, panel discussions, and more! We really would like to show what a fun, fascinating, and fulfilling experience numismatics can be for everyone! Louise Boling won the WIN Gloria Peters Literary Award for the best article published in Winning Ways during the previous calendar year for her article, “A Novel Way to Display a Collection: Jack L. Boling – A Life in Stitches.” We also drew our 25/25/50 Summer Seminar Scholarship raffle winners! After the board meeting, I again gave my Penny Pots and Pins presentation. When I got back to the bourse floor, I took a few minutes to view all the exhibits. There were definitely some very creative and interesting exhibits I also stopped by the NGC and PCGS tables for a brief photo op. Both tables were still very busy even on Saturday morning! These three are my handsome dark side friends from Daniel Frank Sedwick - Dan, Conner and Augie I didn't get to spend much time with my bff Cindi, but anytime we are together is a hoot! I also ran into another good friend, James Sego of QC Coins. He had just closed a deal on this very rare 1833 $10 gold coin for in the neighborhood of $1 million! Soon it was time to pack up and head to the airport for my flight back home. Now I thought spending the night in the airport on the way to Philly was a pretty bad flight experience, but my trip back home turned out to be even worse. My flight from Philly to Dallas took off just fine, but when we got to Dallas we began circling the airport due to Thunder and lightning storms over Dallas. They then diverted us to Tulsa where we landed and waited 2 hours to refuel, then we headed back to DFW. Since I realized I was going to miss my connecting flight to OC, while waiting on the plane in Tulsa, I went ahead and got a hotel in Dallas and rebooked my fight to OC for the morning. By the way, there was a group on the plane who were actually headed to Tulsa through Dallas. When they found out we were being diverted to Tulsa to refuel, they asked the flight attendant if they could simply deplane in Tulsa but were told they couldn't since we wouldn't be going to a gate. That would mean they'd have to sit there with the rest of us, go back to Dallas, spend the night, then catch another flight to Tulsa the next day - what a waste! Well, the airline came to their senses and a flight attendant led those passengers off the plane, onto the tarmac, and into the terminal so they could go home. They would have to get their bags later, but who cares about your bag at that point! Almost 7 hours after we left Philly we finally landed in Dallas only to find found out there were over 100 other planes waiting for gates due to the the weather problems. So we spent another 2 1/2 hours just sitting on the plane on the runway waiting for a gate. Finally the pilot told us we had a gate! Yippee! So we're all cheering as we taxied over to the gate - only to stop a few feet short. Ugh! Now they had no guy with the orange stick to guide the plane to the gate! So we waited another 1/2 hour just short of the gate - so close but so far! We finally got a stick guy to lead us to the gate where we pull up next to the terminal. But wait! Now there was no one to operate the jetway that they put next to the plane so the passengers can deplane into the terminal. Again Ugh! We waited another 20 minutes for that person to arrive and do his thing. By the way, I almost forgot. There was one stellar amazing person in all of this mess who kept everyone on a positive note, including her young crew. Jenny, the head flight attendant, was so kind in spite of a lot of grumbling, always had a smile on her face and a funny story to tell. So over 10 hours after I began a 3-hour flight, we finally set foot in the terminal in Dallas. I ask the lone gate agent how to get to the Hyatt which is supposed to be within walking distance of the airport. He gave me convoluted directions which I tried to follow but got lost. There are very few airport personnel at 2am but I finally found a security guard and asked him. All I know is I ended up in a dark deserted parking lot within view of the Hyatt but behind a short block fence. I finally just called the hotel and they told me to go back to the terminal and they would send a shuttle. Finally, I arrived at my hotel where I got my room, saw the big fluffy bed and just passed out. Thank goodness there were no issues the next day with getting back to OC. My checked bag was even waiting for me at the OC airport! Let me tell you, with not making it to Baltimore last spring and then trying to get to and from Philly, these recent flight mishaps really make me rethink this flying around the country to do my coin thing. However, I’m sure when the next trip comes around I’ll be excited again but until then I'm happy to remain on the ground! I can't tell you how very happy I was to see my hubby, to be home, and of course to see my sweet loving Penny! Next up: the Long Beach show in two weeks and then the Santa Clara show (where I get to simply drive to/from both!). Charmy's June 2018 LONG BEACH SHOW REPORT w/lots of Pics! With summer here, I usually only have one show a month, which leaves more time to spend with my family. Last weekend we were very fortunate to celebrate my dad's 97th birthday! Many of you have heard me talk about him being in the Navy and a Pearl Harbor survivor, so we are especially proud to still have him with us. With less shows during the summer, I especially look forward to each show I do attend. And the Long Beach show is one of my favorite shows since it is so close and I get to see a lot of my local friends and customers, as well as sleep in my own bed each night! I arrived as usual to the loading dock area around 10:30 am the noon set up time. Since they only let a handful of cars up at the loading area at a time, it helps to be there early. Instead of waiting in the long car line, I decided to pull next to the ramp, unload my inventor onto my cart, and my booth helper and I pushed the cart up the ramp to the back door and waited to be let in at noon. That was much quicker than waiting for each car to go up the ramp, unload, and eventually move their car. After I set up my booth (in record time with three booth helpers! ), I did my usual buying from a lot of the vest pocket dealers, as well as my regular dealer friends. By the end of the show, I definitely out-spent my show sales, which some times happens when a show is on the slower side. When I got home and set up the coins to photograph, Penny got very curious and I had to hold her back from sitting all over the coins! (She's also a huge rubberband fiend and I have to hide them from her.) In the later afternoon when things died down, I opened one of my favorite wines, Rombauer Zinfandel. After set up was over, my boothmate Rich and I went to dinner at our usual Wednesday night Long Beach restaurant, Cafe Piccolo's, with our foreign coin dealer friends, Karl and Joanne Stephens. We each bring a bottle of wine to share and have an informal tasting and "judging" of each wine. I also picked up a couple of scarce Condor tokens from Karl for my personal collection. On Thursday, Fred Weinberg stopped by my table and handed me this interesting Conder token that he had gotten in a group of coins. It came with a note that stated it was a Die Trial Uniface Strike. However, I contacted my favorite Conder dealer, Gary Groll, who sent me this response: "The token is not associated with Cambridgeshire, is not a halfpenny, not a die trial, nor a uniface mule. It was manufactured by Peter Kempson for use at the Birmingham Workhouse and is one of three different denominations produced. The obverse is a stock die that Kempson used for a number of tokens; the reverse displays punches signifying 1s (shilling) and 6d (pence), or eighteen pence. It is illustrated on page 259 of D&H; noted as Warwickshire 3. The token is readily available." Thank you Fred and Gary! Thursday was very busy, and I did more buying and selling. I apologize, but unfortunately, I neglected to take photos of the Tyrant Collection, but thankfully I see some others have posted photos of the exhibit. I borrowed a couple photos from the Long Beach Expo Facebook. Hopefully those of you who attended the show stopped by to see these amazing coins. There was a guy who was alleged to have stolen coins at several local shows but for various reasons wasn't arrested. He showed up at the Vegas show last month and was watched by dealers and security but they didn't see him steal anything at that show. He also showed up at the Long Beach show on Thursday and Friday and was immediately flanked by security and watched from the catwalk above. Apparently, the show promoters are not able to eject suspected thieves like him unless they are convicted. But it was interesting because many of the dealers knew him from the other shows and passed the word around so everyone was keeping a close eye on him. He's the big guy in the red plaid shirt in the background to the right of Chris. I don't believe he was caught stealing anything during the show, but he did try to exit the show through the back doors where the dealers come and go, which was suspicious, he was told he had to leave through the door at the front of the room. My good friend Buck who also helped during set up brought me this great bottle of Feathers red wine, which we really enjoyed. After the show on Thursday, we joined several other dealers at Naple's Ribs. This Long Beach show Thursday night ritual is set up by our dear friend Ernie who reserves the back room of the restaurant for whichever coin dealers want to go. Ron Guth and Ernie Me and Todd/BlueCCPhotos Nina always enjoys whatever she's eating! Roger/MustangGT (Todd's dad) Rick Snow and Richard Murchanian - the glare from the mirrors made them look like they had light beams shooting out of their fingers! Some of Naple's Ribs' amazing ribs! Sales on Friday were much slower than Thursday, though I did more than the usual number of people stop by and ask questions about coins they found. I am currently writing an article for the Numismatist on the history of "capped cents" which I have been collecting for some time. Capped cents were created by Louis Werner in the 1930's and were designed around important events during the depression era, such as the Lindbergh kidnapping trial of Bruno Hauptmann, the disastrous Morro Castle ship fire, Admiral Byrd's famous second Polar expedition, Joe Louis becoming the world heavyweight boxing champion, as well as the Lord's Prayer for Easter and three different Santa Claus designs for Christmas. Werner would set up his capping machine at these events, run a piece of copper sheet through the machine, and stamp a design on the copper sheet which is molded over a 1934 or 1935 penny. He would sell each piece for 10 cents. Interestingly, Werner donated his capping machine, dies, and related pieces to the ANA Museum in the 1970's, and they still have it! Doug Mudd at the ANA located it in the basement and Rob Kelly photographed it for my article. I saw an amazing set of some of the capped cent designs on eBay (this sale on eBay was also recently mentioned in an exonumia thread on the PCGS message board). I was thrilled to have won this amazing set of capped cents since it contained some rare silver and gold plated pieces, as well as one struck over a Canadian cent and one struck over a Panama cent which I didn't even know existed. I picked up the set at my post office on my way to the show for Todd to photograph for my article. Todd is still working on the photos so I took some pictures with my cell phone. I'm not sure when (or if) my article will be published but I will let you know when it is! Most of you know that I also collect penny teapots made by prisoners and soldiers during the 1930's and 1940's. Each one was made by hand often using a spoon to tap and mold the penny into a teapot so each teapot is unique. I have collected dozens of them but I have never seen one that actually contained a date until I recently found this one that had the original date from a 1907 Indian cent on the handle. I had Todd previously photograph it and the pictures came out amazing! Friday night, we went to King's Fish House which is located within walking distance of the convention center up on Pine Street. They have a wonderful selection of seafood, even for non-seafood lovers like me! While waiting for dinner, I ran into Steve Ellsworth (ANA Governor) who was waiting for his own group to arrive. King's is one of the few restaurants that doesn't charge a corkage fee (which usually ranges from $10-$25 per bottle), so everyone brought a nice bottle of wine, and we had a great wine tasting dinner party. Just so you know, we don't usually finish most of the bottles so there's plenty left over to take home! Joe and Sarah Wargo and me A dealer friend, John, who is also a wine enthusiast was sitting right next to us so we shared some tastes of wine with his table as well! - these were two of the amazing wines they were drinking. Whenever I go to King's I usually have the same thing because it is sooooo delicious - the macadamia nut crusted halibut! Saturday morning I gathered all the raw coins I planned to submit to PCGS, filled out the forms, put the coins in the PCGS flips and took them over to the PCGS table. This is always a chore as I still need to take care of my customers and the public who come to my table, so it usually takes me a couple hours. Yes, I know, I really should plan ahead and prepare my submissions before the show, but I never seem to get around to it until the last minute! This is my pile of flips from the coins I submitted. The PCGS customer service folks at the show are so wonderful, patient, and always very helpful! The Long Beach Expo's kids' treasure hunt was once again very popular and well attended by a throng of enthusiastic kids! It's so great to see this next generation embracing coins! Saturday had quite a crowd in spite of some of the dealers having left to catch their flights (mostly towards the front of the room). My table is located in the middle of the room and I took these photos looking towards the back of the bourse floor later on Saturday so the crowd had thinned out quite a bit by 1pm. So that's about it. Next week we're headed to our place in Lake Havasu for some fun in the sun with my family and a first boat ride for our grandson! He got a new life jacket and we tested it out on him, however, I don't think he was very fond of having to wear such a bulky vest! Next up: The San Diego Conarama in July, then the Philly ANA in August! Well, it's been quite a while since I've done a show report but I'm back in the saddle again! Since I missed the Baltimore show, I was especially looking forward to buying and selling coins and seeing my friends at the Central States Show. It turned out to be a pretty good show, better for buying than selling, but overall I did a lot of both. I got to the airport Tuesday morning, sailed through TSA and decided to just hang out at my gate and listen to my audio book. We took off to the west as usual, flew out over Newport Beach and the ocean, then turned south then east. Just over three hours later we were landing in Chicago. O'Hare is a pretty large airport and it seemed like it took forever for me to get to baggage claim. Luckily Rick and his son Kenny were arriving not long after me and were renting a car, so I just waited for them, and soon we were checking into the hotel. When I arrived in my room, I was so pleasantly surprised to see this very nice bottle of wine with glasses and an opener waiting for me! After settling in, I joined Rick and Kenny for dinner down in the hotel bar. I enjoyed a wonderful glass (or two) of Beringer Knights Valley Cab. We ordered from the steakhouse restaurant menu and had a wonderful steak dinner. I asked for a little crab topping, and this is what I got! After dinner, we were joined by a very good friend of mine, Mitch Ernest, who is the new president of Central States Numismatic Society. Kevin Foley, the Central States bourse chair, stopped by briefly to say hi. At the bar I ran into another good friend, Nina (who is with Kagin's Auctions), as well as Jim Halperin (Co-Chair of Heritage), and Ian Russell (owner of GreatCollections). Wednesday morning was set up so dealers were lined up and anxious to get in. Kevin Foley, Sam Ernst (Mitch's son who is also on the board of CSNS) and Mitch Ernst all "manned" the Message Center at the front of the bourse. After I was all set up, I began shopping and buying lots of Pretty Pennies! I think I bought more at this show than I have at a show in a very long time! I had a few want lists to fill, and I was able to fill lots of holes in some of those lists! These are the coins I bought throughout the show. I also am thrilled to have found a coin for my own personal collection. It's a beautifully toned 1870 PCGS MS65 BN with the pick axe variety. It also happens to be the CoinFacts photo for 1870 BN. David McCarthy stopped by and we had a nice chat. He always has some great stories to tell and I thoroughly enjoy listening to them. Also, I just found out he is being awarded the ANA's Numismatist of the Year Award, which is a great honor and extremely well deserved! When things died down, it was time for some wine and cheese, in addition to some good ol' rock and roll! So this is how The Penny Lady likes to do coin shows! After the show, we headed over to Victoria Station in Elgin. I wasn't doing that great until towards the end when I finally hit a nice little jackpot of my favorite slot machine, the Buffalo penny slot machine. The good news is that I won $1,223 but the bad news is that this amount is just over the $1,200 minimum that requires the recipient to pay federal taxes! Of course I am still very thrilled to have won another jackpot! Thursday morning I had a WIN board meeting at 8am. Last year, WIN received a very sizable donation from the Newman Education Society and we've been discussing ways to put that money to good use. Although I see more and more women showing an interest in numismatics, I think women are largely an "untapped" numismatic population and I know we can do better to get them more involved. We are tossing around the idea of having several events next year that would celebrate women IN numismatics as well as women ON numismatics. If any of you have some specific thoughts or ideas on showing how fun collecting coins, paper money, medals, exonumia, etc. can be and how we can get more women involved, I would love to hear from you. And of course I will let all of you know more as things are firmed up. At our general meeting, Joe Boling gave a very interesting presentation on banknotes and printing technologies. When the bourse opened to the public, there was a steady stream of people coming through the door and the show stayed busy throughout the first part of the day. Although I had some decent sales, I also had a lot of people stopping by to ask questions about coins they found or bought, or general questions about their collections, etc. It was great to be able to talk to so many people who have a passion for pennies! Later in the afternoon when things died down, I opened the bottle of wine that I had brought with me. It's one of the Southern California vineyards I belong to and I really enjoy this "not too expensive" wine. I was invited to go to the Cubs game Thursday night, but me being born and raised in Southern California and a huge cold wimp, I declined to go because I know I would have been miserable sitting in below 50 degree weather. So I asked Rick and the guys to take photos of the game for me. And to top it off, the Cubs won! So I went to dinner with my good girlie buddies, Nina and Emily Silver (Americana Rare Coins), and Rob Wheelhouse. We ate at the hotel steakhouse and had a great time together! The food was amazing, and we enjoyed listening to a musician playing guitar and singing right next to us. After dinner, instead of joining the large crown of dealers in the bar next door, we all just called it a night and went to our rooms! I enjoyed getting into my jammies, putting my hair up, crawling into my very comfy bed, and watching tv until I fell asleep! Friday morning I didn't have to be at the show until sometime before the public came in, so I got to sleep in a little. Friday started out a little slower but soon ramped up and I became pretty busy. Several folks stopped by to say hi but I neglected to get their photo for my show report. But I finally got my wits about me and remembered to ask Tom Wagner and Sam Ernst to pose for photos! I blame my recent hiatus in preparing show reports for my lapse in taking some of my typical photos, including shots of more forum members and the general bourse floor, for which I sincerely apologize! After the show on Friday, a large group of us went out to Yu's Mandarin for some good old fashioned Chinese food! What a great time we had with all these crazy, fun loving young folks! Starting with Nina, from left to right, there was Jordan, Matthew, Ryan, "Kid hahaha," Shae, Greg, Bjorn, Jeanene, Louis, Billie (words at CDN), me, Rick. The chefs demonstrated how they make noodles in the kitchen. While Nina demonstrated how to eat a chicken wing! Meanwhile, Rick's son Kenny, was having his first "shot" which he downed like a trooper! After dinner, we headed back to the hotel and ended up in the bar, along with many other dealers, for our last night in Schaumberg! I thoroughly enjoy being able to socialize with the people who help make the wonderful world of numismatics go around! And here are just a few of its luminaries: John Dannreuther, Rick Snow, Mark (Mid-American Rare Coins), and Tom Caldwell (Northeast Numismatics). Another good friend and all around wonderful guy, James Seko (JMS Coins/QA Coins) Saturday morning I took some time to view the exhibits. Central States gives out some big prizes (gold and other coins) for exhibit winners and thus the competition is usually pretty fierce. These are just a few of the exhibits I found interesting. I ran into Fran Lockwood who used to be in charge of the CSNS exhibiting. Her husband, Ray Lockwood, recently passed away. He was a former Central States President and long time Board of Governors Member as well as CSNS Education Director. Fran talked to me about Ray's last days and showed me the pictorial memorial she and her friend put together for Ray. I then stopped by the PCGS and ANACS tables for a quick photo. Then hobo nickel carver, Joe Paonessa, came by and chatted with me for a while. I usually get to spend a little time with him at the ANA Summer Seminar, but unfortunately I won't be there this year. He showed me the new ANA medal he just finished carving for this year's seminar (a sample of the medal is in his badge). This is Rick, Joe and Kevin. Rick showed me this very cool coin he just picked up from the auction. It's a pattern two cent which shows the very first U.S. coin to depict a president. Soon it was time to pack up and head over to the airport for my flight home. I hitched a ride again with Rick and Kenny which always makes it nicer to travel in groups rather than alone. A special thanks to Kenny who is great at helping to load and unload all those heavy bags! Even though TSA was pretty crowded, they were still very careful about checking all the dealer coin bags, including mine and Ricks' bags. They went through every inch and started to pull out every coin, but soon got tired of doing that and decided to just spot checked the double row boxes and trays of raw coins. This is me keeping a smile on my face through it all! Then I headed to my gate, waiting for my flight, settled into my seat, and enjoyed a comfortable, problem-free flight back home. Bye-bye Chicago til next year..... Hello home sweet home Orange County! My hubby wasn't home to pick me up since he is still at the NORRA 1000 in Mexico pitting and chasing for one of his buddies. No, Lou is no longer racing due to the fusion in his neck from his crash two years ago, but he definitely still loves being part of offroad racing and the racing team gets the benefit of his years of experience and exceptional mechanical skills. But my sweet purring kitty, Penny, was home to greet me! This is her just before I left when I was getting my coins ready. She decided to grab one of my coins for herself! Next up: The Las Vegas/Westgate Show in May, then Long Beach in June. Hope to see some of you there! Charmy's February 2018 LONG BEACH COIN SHOW REPORT w/lots of Pics!